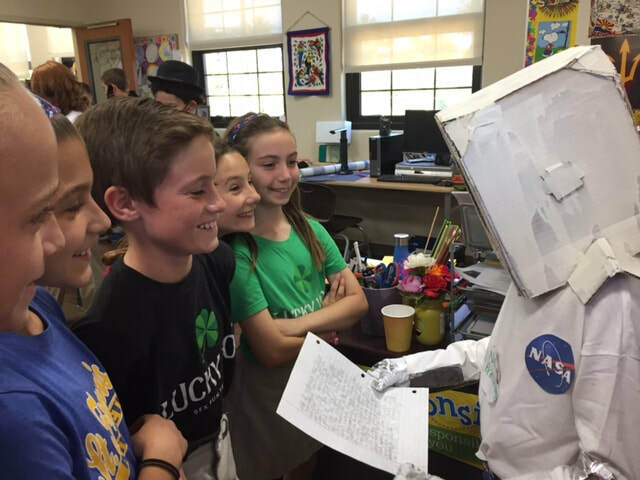 The curriculum for students entering third - fifth grade takes a step up, emphasizing the application of skills developed in earlier grades. Teachers foster independence and responsibility. We follow the blended learning model way of teaching, which encompasses technology into our daily lessons through small group instruction. Students are now provided with many opportunities to learn about choices, and increased responsibility for the quality of their work, and more accountability for their behavior in the classroom. English Language Arts: The intermediate level uses the Journeys program. The Language Arts program focuses on developing the student's abilities in listening, reading, writing, and speaking with confidence. Students are introduced to anchor texts which provide a wide range of domains and topics through high-quality texts and focused instruction. As part of the Common Core State Standards, students analyze the text. Students learn new vocabulary and helpful strategies to read more complex texts. Vocabulary is extended through speaking and listening activities. In addition to the reading program, students complete monthly book reports around an established genre. The language arts program is woven through all other areas of studies. Mathematics: Eureka Math is a curriculum written by a team of teachers and mathematicians to present math in a logical progression from PK to 12th grade. The materials were developed based progressions which outline mathematical cognitive development. It’s not enough for students to know the process for solving a problem; they need to understand why that process works. Teaching mathematics as a "story," Eureka Math builds students’ knowledge logically and thoroughly to help them achieve deep understanding. While this approach is unfamiliar to those of us who grew up memorizing mathematical facts and formulas, it has been tested and proven to be the most successful method in the world. Students will add, subtract, multiply and divide with fluency. They will be doing a great deal of mental math as well. The strategy, bar modeling, will also be used for problem solving. Science: Science follows the Diocesan Curriculum with concepts involving the cycling of energy and nutrients through ecosystems. Physical Science deals with the structure and properties of matter. Earth science teaches the parts of the atmosphere surrounding the earth and space systems--stars and the planets. Science skills are taught and used throughout the year in all of the concepts. 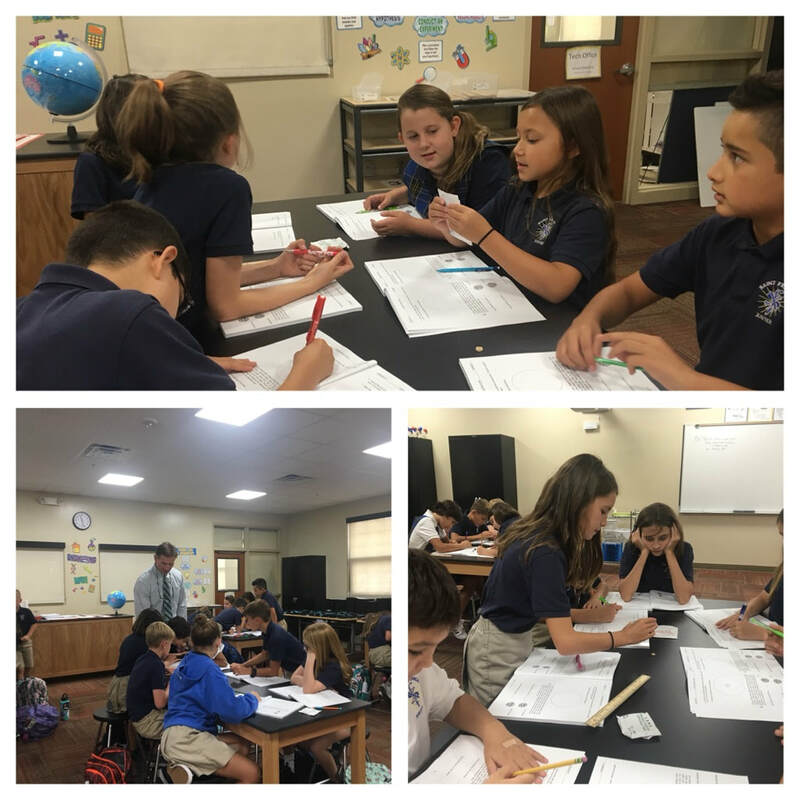 ​Social Studies: Social Studies follows the Diocesan Curriculum with parts of study including Arizona History, European History, the Civil War and European World Explorers, Landforms, and American Government. Fifth Grade students working in the new stem lab at SFX.